Okja by Bong Joon-ho, best known for Snowpiercer and The Host, is a Netflix film starring Tilda Swinton, Jake Gyllenhaal, Paul Dano, Steven Yeun, and Seo-Hyun Ahn as Mija the little girl who has spent her whole life with Okja on her grandfather’s farm in South Korea. 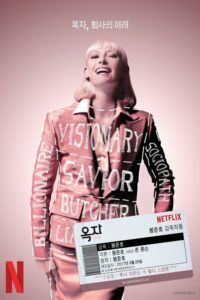 Okja is a genetically modified superpig, which Tilda Swinton’s Lucy Mirando hopes will rejuvenate the Mirando Corporation. As an aside, Tilda Swinton is fantastic. Twenty-six superpigs were given to regional farmers to raise traditionally over a ten year period with Okja eventually chosen as the best and brought to New York City for a big celebration. Mija of course doesn’t want to loose her friend and so begins the journey to save Okja. Along the way we meet Jake Gyllenhaal’s Dr. Jonny Wilcox, who reminded me of Nigel Thornberry from the Nickelodeon’s The Wild Thornberrys, only a shell of his former famous self. You also meet Paul Dano’s Jay, the charismatic leader of the ALF cell trying to free Okja and Steven Yeun’s K, one of his followers. Along with the grandfather and Mirando employee Mundo Park (played wonderfully by Je-min Yun) all the characters are somewhat gray and no one is clearly black and white. Over the course of Okja’s two hour run you go a lot of places and it moves fairly predictably, but the characters and the actors that bring them to life make the journey worthwhile. The computer generated Okja, while at time can look a little fake, also draws you in but not by being hookie, cartoony, or anthorpromoric, but by being a real animal. Bong Joon-ho obviously has a point to the story but he doesn’t force it on you or tie a bow around everything; instead you are left to digest and ponder what he showed you and perhaps decide for yourself. Okja isn’t a classic, but it is still expertly crafted and preformed, so check it out if you have Netflix. Previous PostPrevious Get In The Ring With GLOW! Next PostNext Spider-Man Comes Home!